so there are no levers, switches or knobs to worry about!  Only suitable with Adblue®.  Meter. Turbine, accurate to +/- 1%.  Pumping unit. Direct drive pump and motor. 999,999.9 litres, totaliser shows up to 999,999 litres.  Standard equipment. 4m delivery hose, pulser.  Choose between right facing or front facing nozzle holster.  Dimensions. 1410mm H x 580mm W x 515mm D.
 (NOZA.SS.AB) or (ZVA.AB) nozzles also available. 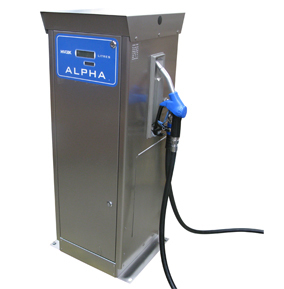  Dispenser option available for use with submersible pumps (ALPHA.DSAB).